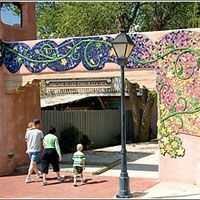 Information about things to do in Albuquerque. Albuquerque offers an array of activities. Explore all that Albuquerque has to offer. Our libraries are a favorite spot. Visit a library. The iconic KiMo is a unique venue for entertainment. Visit the KiMo. This Center features a theater, art gallery and library. Visit South Broadway Cultural Center. The museum chronicles more than 600 years of Albuquerque history. View more. Houses the complete history of hot air ballooning. Visit the Balloon Museum. Civic Plaza is the center of our community. Visit Civic Plaza.